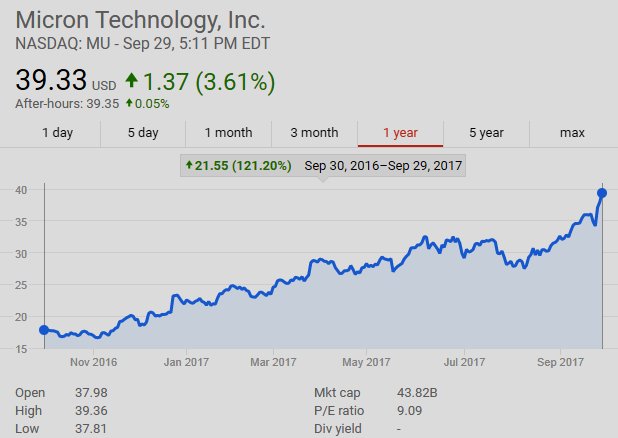 Tech Review (TR 2017-09-30)--Domain Mondo's weekly review of tech news with commentary, analysis and opinion: Features • 1) Bitcoin, Cryptocurrencies, Hackers, Thieves, Cybercrime, 2) Investing: $MU, Q3 2017 closes higher, Fed Watch, Trump's WTO reforms, Independence Votes & Black Swans, 3) Fake News = Data & News Media + Confirmation Bias, Liberal Bias, Groupthink, and False Narratives, 4) ICYMI Tech News, 5) Coming October 4. Bitcoin, Ether wrap up month with steep losses | MarketWatch.com: "... U.S., China and South Korea tightened rules surrounding exchanges and so-called initial coin offerings ... J.P. Morgan Chase & Co. CEO Jamie Dimon and Bridgewater Associates’s Ray Dalio ... said the digital currency was in a bubble." Chaos and hackers stalk investors on cryptocurrency exchanges | Reuters.com: "Online exchanges for trading bitcoins and other virtual currencies can make fortunes for their owners. But they are largely unregulated, besieged by hackers and thieves, and fraught with risk for consumers ..."
Crypto-currencies’ strength becomes their weakness | Reuters.com: "Freedom from regulation was the big draw of bitcoin, ether and their proliferating kind. But the exchanges set up to trade them often lack basic controls over identity, fraud, technology and even volume ... Without fixes, that will consign digital currencies to the financial fringe." Eight Things Cryptocurrency Enthusiasts Probably Won’t Tell You | Great Wall of Numbers | ofnumbers.com: Shady exchange and ICO practices, conflicts of interest in journalism, and other serious issues in cryptocurrencies are largely ignored by the media. "Cryptocurrencies continue to be exploited by cybercriminals, with Bitcoin being the currency of choice in criminal markets, and as payment for cyber-related extortion attempts, such as from ransomware or a DDoS attack. However, other cryptocurrencies such as Monero, Ethereum and Zcash are gaining popularity within the digital underground." (emphasis added)--Europol report | DomainMondo.com. However, the news wasn't all bad--Japan's FSA gives official endorsement to 11 cryptocurrency exchanges | Reuters.com. Sun Co-Founder Gets Secretive Hedge Fund to Make a Huge Chip Bet | Bloomberg.com: "Bill Joy sees DRAM chip market shedding its cyclical past - Joy persuades Water Street to stop shorting Micron and go long ..." Micron $MU (NASDAQ:MU) (domain: micron.com). Why Hurricanes Won't Force the Fed to Ditch a December Rate Hike | TheStreet.com: This year's third rate hike may be followed by three more in 2018, the Federal Reserve has indicated. Fed Chair Janet Yellen: "Growth will likely bounce back as activity resumes and rebuilding gets under way." The likelihood of further hikes is good news for banks from JPMorgan Chase & Co. $JPM (NYSE: JPM) to Citigroup Inc. $C (NYSE:C), which often boost margins by passing increases on to borrowers more quickly than to the depositors whose money is used to fund loans. U.S. [Trump's WTO rep] shocks WTO with a novel take on trade dispute rules | Reuters.com: “I think it’s the first time somebody said you need positive consensus. It means that any member can block the whole thing" said one trade diplomat who was in the meeting. “It’s power politics,” said another. Catalonia Vote a Black Swan for EU, ECB, Spain, Markets, Economy? 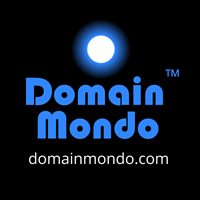 | DomainMondo.com--continuing LIVE coverage thru the weekend on the October 1 independence referendum in Catalonia. See also Last flight departs as Iraq imposes ban for Kurdish independence vote | Reuters.com. The Media Has A Probability Problem | FiveThirtyEight.com--by Nate Silver: "The media keeps misinterpreting data ... the media has often overestimated the precision of polling, cherry-picked data and portrayed elections as sure things when that conclusion very much wasn’t supported by polls or other empirical evidence ... documented throughout this series, polls and other data did not support the exceptionally high degree of confidence that news organizations such as The New York Times regularly expressed about Hillary Clinton’s chances. (We’ve been using the [New York] Times as our case study ... because their 2016 coverage had so many problems.) ... Probably the most important problem with 2016 coverage was confirmation bias — coupled with what you might call good old-fashioned liberal media bias ..."
Ikea has bought TaskRabbit | Recode.net: "The Swedish home goods giant is looking for some digital help from the contract labor marketplace."